Wintertime is citrus time. Which is nice because we can use a little brightness shining through these bleak miserable days. Oranges, grapefruit, lemons and limes bring a much-needed splash of color to the table and complement those rich, dark hearty soups and stews that are the other thing that make these cold months so bearable. I like to add orange or grapefruit wedges to salads. They work especially well with beets and winter greens. And there are so many varieties out there these days. Every season I find one that stands out. A few years ago it was clementines, then blood oranges. The Florida honey tangerines are always super sweet, which is a good thing because they are full of seeds and only their honey sweetness makes it worth working through all of the seeds. Mineolas have been particularly good for the past couple of years. A cross between grapefruit and tangerines, they are both sweet and tart at the same time, and have an intense, sharp flavor that makes them particularly good in salads. The best way to utilize citrus in a salad or other dish is to cut it into segments, which is called supreming. This method releases the segments from the membranes and creates little jewels of flavor. I always eat my grapefruit this way now. I'll supreme six at a time into a big bowl and then I have it ready whenever I want it. First, you cut off the ends of the fruit, making sure to expose a good amount of the flesh. Squeeze the juice from the two ends into a bowl; you can use it for the dressing, or add it to sparkling water. I should warn you right here that you are going to be leaving quite a bit of flesh behind. 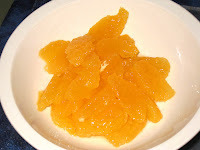 If you worry too much about that you will end up with shredded pulp instead of fruit segments. Put a cut end down on a steady cutting board. Place a sharp knife against the top cut end and slice down the side, being sure to cut past the membrane. Again, it will seem a little wasteful but it's the only way to get the segment out. 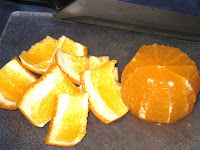 If it looks like you cut too much of the flesh away, squeeze it into the bowl to capture more of the juice. You might not get all of the peel and membrane off with the first cut. After you have cut the first pass around, just go back and clean up anything you left behind. 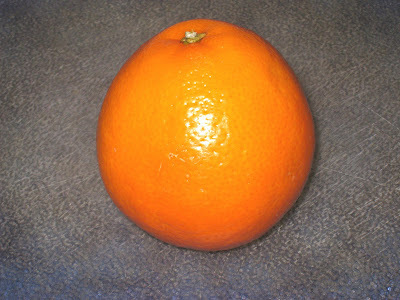 Here is what the orange will look like once you have removed all of the peel and membrane. 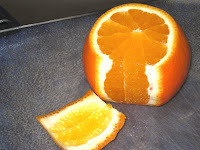 It's ok if there's a little of the pith remaining. Just be sure that none of if crosses over the back of the segment or you will have trouble getting it out. Pick up the fruit in your non-dominant hand (right hand in my case) and hold it over a bowl. See where the membrane lines are? Take a paring knife and cut down one side of that line as closely as you can, then twist the knife under the arc and push the segment away from the membrane on the other side. Or cut down the one side and then cut down the other to release the segment. You might have to experiment a little to find the method that works best for you. 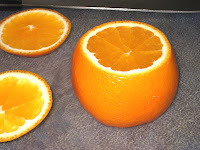 Rotate the fruit in your hand as you continue to remove each segment from the membrane. Don't worry about trying to get all of the flesh out or you will drive yourself crazy. 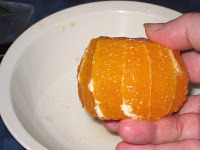 Once you have removed all of the segments, squeeze the juice from the flesh that remains with the membrane. You will end up with enough juice to make a heavenly vinaigrette. Or, if a dressing isn't in the works, just drink it. Awesome. And here you can see a bowl full of beautiful wedges, just waiting to be thrown into a salad. I usually just use one bowl for both the segments and the juices but I wanted a clean shot for the camera. And there you have it. Nothing could be simpler. I have been really enjoying the blood oranges (moro's for the more squemish, I guess) this last month. They are so beautiful and sweet.